Have you ever had your chuck or faceplate get stuck on your lathe spindle? We have the solution. 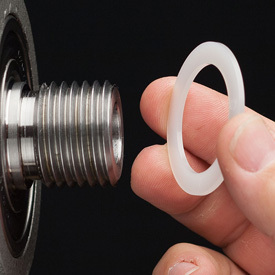 Our team has developed the Turners Select™ No-Lock Spindle Washer using a special DuPont® plastic that will prevent your chuck from ever getting stuck again. The No-Lock spindle washer is highly resistant to wear and abrasion giving you years of dependable service unlike pressed-fiber washers. Give these washers a try, you'll wonder how you ever turned without them. Comments On Jan 23, 2017:Never knew that I needed one but I tried it on a whim and cannot believe how great it works. All of my chucks and face plates can be removed with nothing that a turn of the hand. Comments On Oct 12, 2016:This washer keeps your chuck from locking on your lathe spindle. I use it all the time. Stuart Batty has said that using a washer can possibly add vibration to the mix; however, I would rather deal with the possibility of vibration than having a chuck stuck on my spindle. But that's just me. Comments On Apr 24, 2016:My chuck was always getting stuck on the lathe. I just happened to see these when putting in an order and picked one up. Problem solved! It does exactly what it's supposed to do. Comments On Jan 13, 2016:It's a very simple washer, however it really makes it easy to change out chucks and face plates with it in place. Comments On Apr 02, 2015:Purchased this for a spare, glad I did. Didn't notice one stuck to the chuck and fell to the dust collection which didn't do it any good. Put on the new one and hasn't come off since. Comments On Dec 25, 2014:For such a simple thing it works exactly as advertised and is nice to have. Comments On Dec 29, 2014:These simple washers eliminate the need for wrenches to unstick a chuck. Suggest buying a spare as they wear out in a few months if you change chucks frequently. Comments On Dec 29, 2014:This does make removing a Chuck easier. Well worth the little cost. Comments On May 18, 2014:My Talon chuck did not quite reach the drive shoulder of my Jet lathe, so the chuck would wobble. Two of these washers lets the chuck seat firmly against the shoulder and now it runs true. Comments On Jan 03, 2014:I had diffiulty removing my chuck prior to purchasing and using this washer. The washer really keeps the chuck from getting jammed and having to use a lot of force to remove the chuck. Also,I bought two, but only one was shipped. Craft Supply was very good about sending the second washer free of charge. Comments On Dec 15, 2013:These are great and inexpensive and they seem to stay on the lathe better. Simple item, but worth every penny! Comments On Oct 03, 2013:I honestly didn't even realize that I needed the no-lock spindle washer, but once I'd installed it, I immediately realized its value. I compared the difference between removing the chuck with, and without the washer, and I dont beleive that I will ever again attach a device to my threaded spindle without the no-lock washer! Comments On Jan 21, 2013:This has made my life very easy as I do not need the tools now to change the chucks. I have only five chucks but some time I have more than one project at any one time and I do not like to remove the items without the chuck until it is finished and it used to be a struggle now I can unlock the chucks by hand only it a must if you need to change items frequently. It is solid and easy to fit with a resistance to dust. All machines should have them as standard.